Motorola has announced the availability of Motorola ADMIRAL, which would be the first Android powered device with Sprint Direct Connect, which is an instant push-to-talk service for groups and individuals. Moto ADMIRAL will be available from October 23 for $99.99 with a new line or eligible upgrade and two-year service agreement. 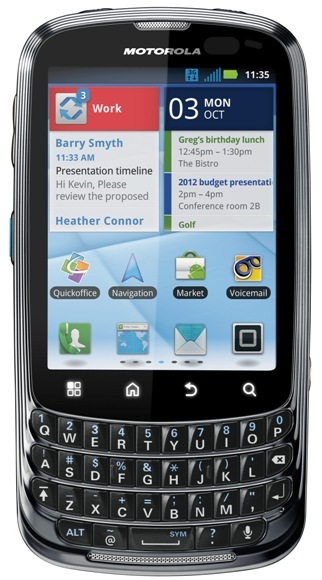 1.2GHz processor, 3.1-inch VGA touchscreen display and QWERTY keyboard. Sprint Direct Connect – It is an Instant, one-to-one push-to-talk calling on the Sprint network, with any other Direct Connect subscriber. NextMail – Users can send a recorded message to any email worldwide or mobile handset via text message by using the Direct Connect button. Call Alert with Text – Users can send an audio alert with an optional text message to let another Direct Connect subscriber know you are trying to reach them and why. Group Connect – This will allow Direct connect users to communicate with up to 20 other Sprint Direct Connect subscribers all at once. Availability Notification – Users can request the availability status of another push-to-talk member and, in case they are busy, request a notification when they are free.